Trade ministers in Asia-Pacific have given the green light to most terms of a free trade pact meant to smooth the flow of goods and commerce in the region after extensive negotiations in Vietnam this week. A joint statement on the trade pact, now with a new name, was issued on Saturday and had been leaked to Tuoi Tre News by the Chilean delegation. "We ministers are happy to announce that we have agreed on the core elements of the Comprehensive and Progressive Agreement for Trans-Pacific Partnership [CPTPP]," Tran Tuan Anh, Vietnamese Minister of Industry and Trade, said in a press conference on Saturday morning. "Some terms of the deal prepared by Japan will be suspended because there are some areas that need to be perfected for the final document signing." Toshimitsu Motegi, Japanese Minister in charge of Economic Revitalization, addedat at the press conference that 20 provisions of the original deal had been put on hold, pending further discussions before any final approval by lawmakers in each country. The consensus on the deal will help spur commerce and economic integration in the region, the Vietnamese minister said. He added that the new accord maintains the high standards as well as quality terms and conditions of the erstwhile Trans-Pacific Partnership deal, while ensuring interests for each party. The CPTPP is a new version of the Trans-Pacific Partnership accord that once included the U.S., alongside Australia, Brunei, Canada, Chile, Japan, Malaysia, Mexico, New Zealand, Peru, Singapore, and Vietnam. In January, the U.S. pulled out of the trade pact, forcing the remaining 11 members to renegotiate parts of the deal with a new name, TPP-11. Motegi said that the 11 CPTPP members were determined to reach a consensus on the trade pact so as to get the U.S. back to the deal. Japan is understood to be the leader of the pact after Washington's withdrawal. All sides are translating the pact into French and Spanish, while checking other legal issues, Motegi said at the conference he chaired with Minister Anh. Trade ministers from the countries had discussed the free trade accord from November 8 to 10 on the sidelines of the Asia-Pacific Economic Cooperation (APEC) summit in Da Nang in the hope that the deal would smooth the flow of goods and commerce in the member economies that accounted for 40 percent of global GDP when Washington was onboard. Negotiations on the TPP-11 were put on hold on Friday after Canada was believed to have pulled out of the free trade pact unexpectedly. But all ministers then agreed to return to the table, leading to their consensus on the free trade pact. Established in 1989, the Asia-Pacific Economic Cooperation (APEC) is a regional economic forum comprised of 21 Pacific Rim member economies that work to promote free trade in the region. Every year, its leaders meet in one of the member economies to discuss visions for the year ahead. Vietnam’s central city of Da Nang takes over the baton this year to host the summit, which is the culmination of the country’s year-long hosting of APEC meetings. 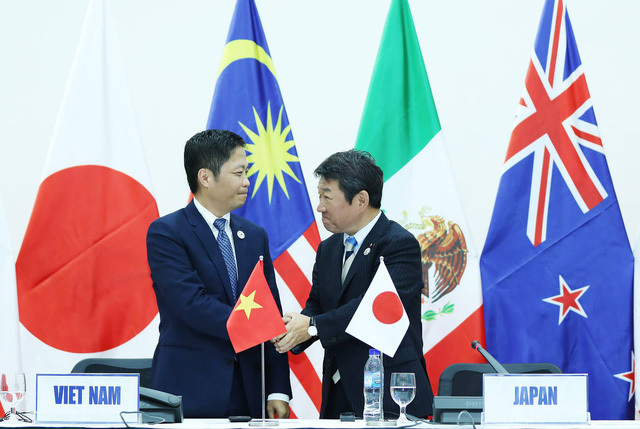 The CPTPP joint statement was achieved and signed by participating ministers after a tense meeting that continued well into Friday night in Da Nang, where the APEC Economic Leaders' Week takes place from November 6 to 11, a Chilean source disclosed. 1. When we last met in Ha Noi, Viet Nam on 21 May 2017, the Ministers of Australia, Brunei Darussalam, Canada, Chile, Japan, Malaysia, Mexico, New Zealand, Peru, Singapore and Viet Nam, reaffirmed the balanced outcome and the strategic and economic significance of the TPP Agreement signed in Auckland on 4 February 2016 (hereinafter referred to as "the TPP") highlighting its principles and high standards as a way to promote regional economic integration and contribute to the economic growth prospects of its member countries, and create new opportunities for workers, families, farmers, businesses and consumers. 2. In May, Ministers tasked officials to engage in a process of assessing options to bring the comprehensive, high quality Agreement into force expeditiously. Over the past several months, officials have worked to reach a balanced outcome that maintains the significant benefits of the TPP. 3. Ministers are pleased to announce that they have agreed on the core elements of the Comprehensive and Progressive Agreement for Trans-Pacific Partnership (CPTPP). Ministers agreed to Annex I and II (attached) which incorporates provisions of the TPP, with the exception of a limited set of provisions which will be suspended. This text also incorporates a list of four specific items for which substantial progress was made but consensus must be achieved prior to signing. 4. Ministers agree that the CPTPP maintains the high standards, overall balance, and integrity of the TPP while ensuring the commercial and other interests of all participants and preserving our inherent right to regulate, including the flexibility of the Parties to set legislative and regulatory priorities. Ministers also affirm the right of each Party to preserve, develop, and implement its cultural policies. Ministers consider that the CPTPP reflect the desire of the Parties to implement the TPP outcomes among themselves. 5. Ministers confirm that the legal instrument proposed for the CPTPP allows the participants to act decisively in a timely manner to advance their shared objectives. Ministers reaffirm that the CPTPP demonstrates their firm commitment to open markets, to combat protectionism, and to advance regional economic integration. 6. Noting Article 6 of the CPTPP, Ministers shared the view that the scope of a review may extend to proposals to amend the CPTPP, to reflect the circumstances‎ concerning the status of the TPP. 7. Furthermore, Ministers decided that all the TPP‎ side letters signed among the 11 countries will be maintained in principle, unless the relevant Parties decide otherwise. 8.Ministers tasked officials to continue their technical work, including continuing their efforts toward finalising those items for which consensus has not yet been achieved, and legal verification of the English text and translation, to prepare finalised text for signature. 9. Ministers recognize that each country will need to pursue its own domestic processes, including ‎for public consultation, in advance of signature.